Bios Mods -The Best BIOS Update and Modification Source - foxconn + 965G micro code update? Bios Mods -The Best BIOS Update and Modification Source > Bios Mods Forum > CPU Support Upgrades > foxconn + 965G micro code update? Full Version: foxconn + 965G micro code update? I have a foxconn G9657MA-8EKRS2H which utilises the Intel 965G chipset. I have read all your tutorials, which were very informative and I think that there is an intel cpu micro code update avialable for the 965G chipset that has been used by HP owners to update and run the wolfdales, so I beleive it can be done. here is a link to the thread..
looks like many people were successful. I would like to learn how to do this myself and was considering subscribing to your "new bios modders" request.. This is a link to the board bios, xxxxx 61 is the latest..
As far as a donor bios would I be looking for a 775 socket board where the 965G chipset already supports wolfdales? Or is this now not neccessary due to the note about ACPITBL. Any thoughts on whether you think this update will be possible? 1) The 965 chipset has a maximum FSB of 1066 MHz. Most Wolfdale parts use a 1333 MHz bus, which is out of spec. 2) Although the microcode update may allow the CPU to boot the machine, the same doesn't apply for ACPI. Speed step is broken and the CPU will run at full voltage, full clock all the time. I have an Intel DQ965GF (Q965 chipset) and mistakenly bought a Pentium Dual-Core E6300 (which uses a Wolfdale core) instead of a Core 2 Duo E6300 some years back. And while the motherboard worked and didn't complain, Speedstep never worked and the CPU always ran really hot and sucked tons of power. I do have the E7500 (fsb1066) which is why i wanted to give it a go. I am also mostly interested in learning the process as well. Have spent many hours reading this is where I am at, please be kind enough to correct me or guide where necessary..
As I understand it I need to find out which codes apply to the E7500 ((1st issue)which at the moment I can't... supposed to be able to do it with info from cpu-z but I cannot see any info relating to cpuid, platform, version and date - which is the format of the microcode updates??) and delete the ones I don't need, making sure I keep the latest version of any duplicates. make the new NCPUCODE.BIN read only via properties..
And insert it back in to the bios..
2nd issue is I don't get any official output when running the following.. I havn't tried re-inserting ncpucode using the following yet, but I am about to..
wondering how you identify the hex which represents the NCPUCODE within hex editor? 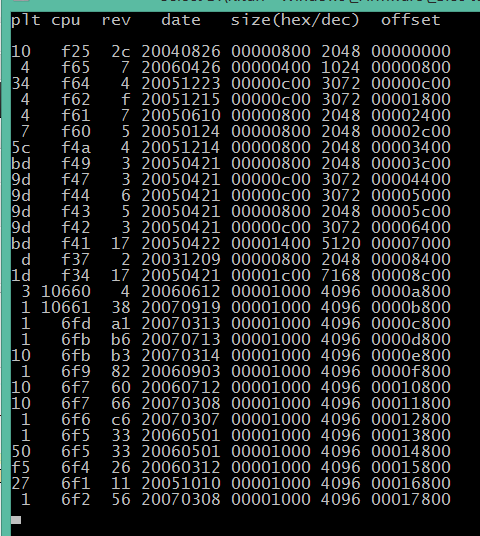 Wanted to look at the system bios in hex editor out of interest, but again I am not sure what command will extract this using cbrom..
cbrom fox.bin / system bios extract cbrom fox.bin / bios extract cbrom fox.bin / original.temp extract don't work..
Would be very grateful for answers to these questions or guidance what is the best way forward.. Please bear in mind that as well as an end result, part of my goal is to learn the correct way to do this myself. Just for reference, this is a screen shot of cbrom195 and the bios..
notice I am not getting email notification of replies.. despite selecting "subsribe and receive email notification of new replies"
wondered why that was? Sorry for any delay in responding..
Hi, thanks for the info..
Can you tell me how you extracted the actual list of microcodes already contained in the ncpucode please. I may like to remove some and i also want to check that my updates appear correctly. I used a personal tool and It does not check if you broke something. (06-26-2013, 12:54 AM)Florin9doi Wrote: [ -> ] I used a personal tool and It does not check if you broke something. If I broke some thing? I'm sorry I don't follow you..
Where did I say I had broken some thing? Nothing is broken, why would you think that? I wanted to learn how to view and access the micro codes myself.. which is why I asked you how you did it? You did suggest in your post that I may wish to delete some of the microcodes in order to allow room for the new ones.. ..but offered no guidance..
Based on what you suggested it would be sensible to learn how to access and edit that information, such as the way you have done it?